Invited by Academician Zhisheng An and Prof. Junji Cao, Prof. Yuan Gao from Rutgers University started her visit for IEECAS on 31 July, 2014. 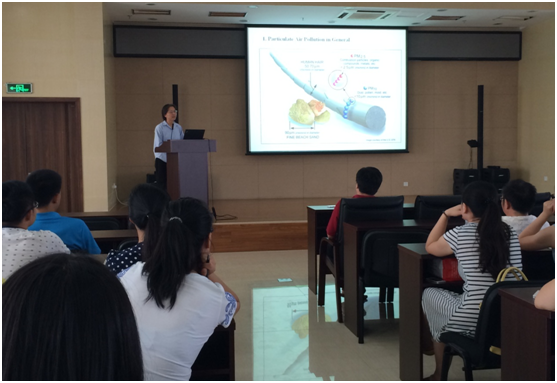 Prof. Yuan Gao gave her talk “Particulate Air Pollution and Its Potential Impact on Global Atmosphere-Ocean Biogeochemical Cycles”in the morning. She introduced her research on particulate air pollution in general, results from US east coast and connections with global biogeochemical cycles. She visited Aerosol and Environment Division and other labs of IEECAS and will spend one week for working and studying with IEE’s scientists and students. After Xi’an trip, Prof. Gao will have a field investigation of loess plateau. Prof. Yuan Gao (Department of Earth and Environmental Sciences, Rutgers University, Newark, New Jersey, USA). Prof. Gao received her PhD in Oceanography from the University of Rhode Island. She did her postdoc at Institute of Marine and Coastal Sciences at Rutgers University at New Brunswick, and after then she worked as a research scientist at the Program in Atmospheric and Oceanic Sciences at Princeton University before joining the faculty at Rutgers University at Newark. Her research covers areas that stretch from studying local urban air pollution to investigating remote marine aerosols, including Asian dust, aeolian iron deposition to the ocean, urban air pollution and atmospheric nitrogen on the US east coast, and high-latitude marine atmospheric chemistry.